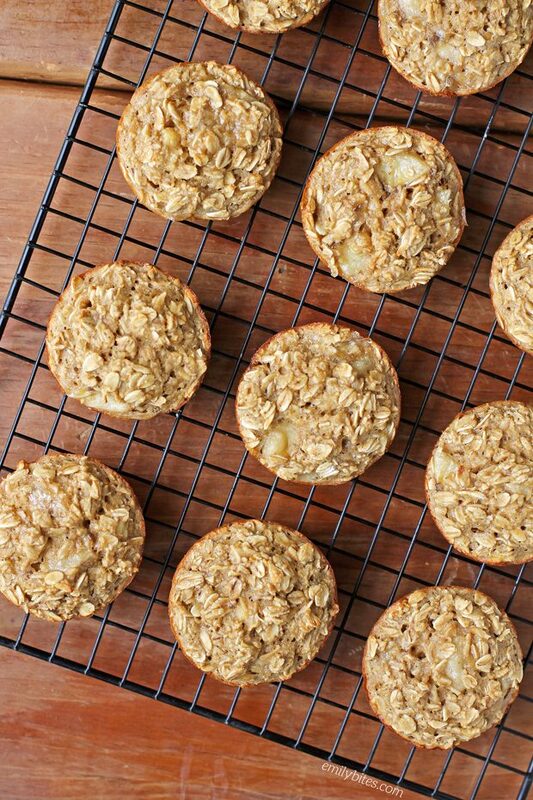 These Peanut Butter Banana Baked Oatmeal Singles feature a classic craveable flavor pairing for a healthy, satisfying breakfast treat or snack your whole family will love. I adore peanut butter, and by using PB2 in these singles I got all the peanut butter flavor without all the fat. If you’re not familiar, PB2 is a powdered peanut butter that is a great way to add peanut butter flavor to smoothies, dips, baked goods, sauces and more. They carry it at my local grocery stores, but if you have trouble finding it you can always order it on Amazon. Y’all know how much I love baked oatmeal singles (I have a ton of different varieties on my site) so I’m always excited to come up with new flavors. What’s your favorite so far? 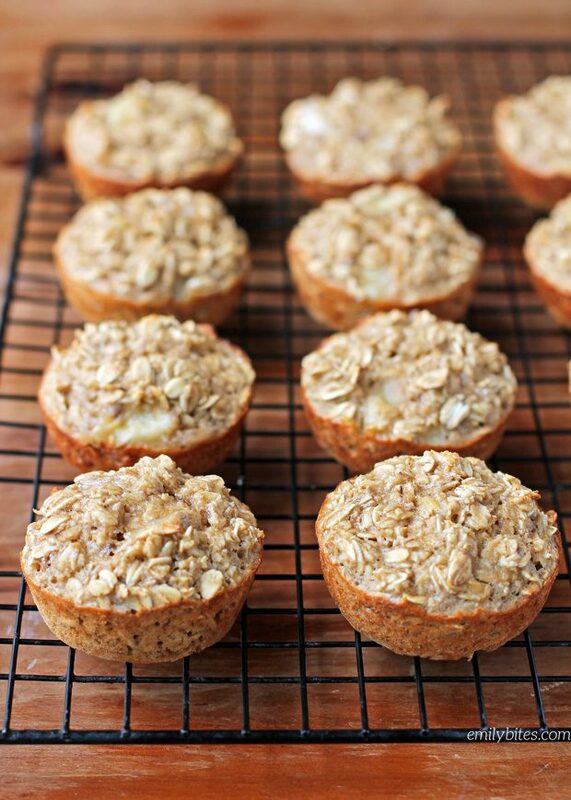 Looking for more baked oatmeal singles recipes? Try my Oatmeal Raisin Baked Oatmeal Singles, Raspberry Peach Baked Oatmeal Singles, Orange Cranberry Baked Oatmeal Singles, Pear Gingerbread Baked Oatmeal Singles, Strawberry Banana Baked Oatmeal Singles, Blueberry Baked Oatmeal Singles, Banana Chocolate Chip Baked Oatmeal Singles, Carrot Cake Baked Oatmeal Singles, Apple Cinnamon Baked Oatmeal Singles, Pumpkin Chocolate Baked Oatmeal Singles, Chocolate Cherry Baked Oatmeal Singles, Pumpkin, Cranberry & Apple Baked Oatmeal or Blueberry Peach Baked Oatmeal! Combine the oats, brown sugar, baking powder, PB2 and salt in a large bowl and stir until thoroughly mixed. In a separate bowl, whisk together the egg white, egg, milk and mashed banana. Add the wet ingredients to the dry ingredients and stir until blended together. Stir in the chopped bananas. These look awesome! Perfect for on the go. Have you ever tried freezing and defrosting them? Curious if you could make a really big batch. Excited to try! Nope, I’ve only ever used regular milk as that’s what I keep on hand. If you try it out, report back! Almond milk would work just fine..
Is this with mini muffin tins or full size? How are these best stored? Sometimes I find with otameal bakes, they become mushy and have a “wet” feeling when left out. Should you refrigerate these? I keep mine in the fridge! Is there a need for a separate egg white (versus two full eggs)? I was wondering if this is to keep it lower in calories/fat or if it serves a purpose for baking? I wonder how those would taste with the chocolate pb2? I haven’t, but that sounds delicious! I too was wondering about the egg white. since eggs are now “free” could we use 2 whole eggs? Also, wouldn’t the brown sugar mix with splenda, (I don’t recall the exact name) that is I think half splenda, half brown sugar work and cut down on points? I’ve never tried it with almond butter so I can’t really speak to the results. Let me know how it turns out! Can you use regular peanut butter? Using regular peanut butter would add 12sp to the recipe and add 1sp to each cup. I made these this morning because I had some banana there were browning and all the other ingredients on hand. They are AMAZING! Even my toddler liked them. Thanks for the great recipe. are you supposed to just use the PB2 powdered, or make it into 6 TBs of actual peanut butter? I have made these twice now – they are SOOOO good and they smell amazing while they are baking!! I can’t get enough of them! Thanks for all the great recipes!! I have made these with Almond Milk without noticing any difference. I use the Truvia Brown Sugar blend (vs. regular brown sugar) and it lowers the WW points down to 2pts per muffin. I’ve also doctored up the recipe a bit adding cinnamon & a whole diced apple. One of my favorite on the go breakfast or even a nice afternoon snack with a cup of tea! YUM! Could you omit the banana and use applesauce in the place of it? Made these today..very good and moist! These are a favorite snack or breakfast, I sometimes cut oatmeal back a bit and add a tab of wheat germ and one tab flax seed. I usually use just 4 tabs PB2 in them as I am in the habit of adding more peanut butter (pb2) when I warm them up and eat them! Love these. Thank you.